When wiring additions to your outdoor lighting or other outdoor electrical power needs, keep in mind that these products require ground-fault circuit interrupter (GFCI)–protected receptacles. 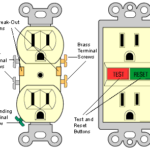 GFCI receptacles look similar to a typical outlet except that they have a third prong hole and “test” and “reset” buttons. Their purpose is to protect people from accidental electrocution because these outlets are often near water sources. Garages, decks, patios, and other outdoor settings are the perfect candidates for GFCI receptacles, and local building codes often require them in these areas (in addition requiring them in kitchens and bathrooms). GFCI receptacle has a reset button. GFCIs monitor the amount of flow to a particular receptacle or circuit, detecting any leakage in current, and they are built to trip in 1/40th of a second in the event of a ground fault of 0.005 ampere. 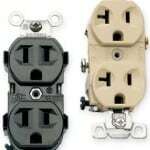 Even if your home was built before these code requirements were in effect, it is worth considering replacing standard outlets with GFCI receptacles in any of the above-mentioned areas. Always remember to check that the power supply is turned off to the area you are working on. Use a circuit tester (also called a neon tester) to confirm that the circuit is dead. Not only will you be working with electricity, but you will also be working in an area that has access or exposure to water, and electricity and water do not mix! 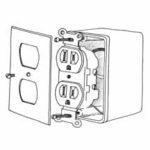 • A GFCI receptacle can be wired to protect a single location or to protect multiple locations by also interrupting power to all devices “downstream” of the outlet. • To protect a single location, the incoming pair of black and white wires is attached to the “hot” and “white” (neutral) terminals on the “line” end. • When protecting multiple-location wiring, the incoming wires are connected the same way as in a single-location setup except the outgoing pair of black and white wires attach to the “load” end. • An alternative to using a GFCI receptacle is to install a GFCI-type circuit breaker in the service entrance panel or subpanel. However, it may not be convenient to re-set the breaker if the outlet is located far from the breaker box. 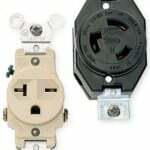 To make the job of installing a GFCI receptacle easier, consider purchasing a complete kit. These usually consist of a watertight box, the GFCI outlet, a gasket to seal the edges of the receptacle, and a “while-in-use” cover—a hinged plastic shield that flips up to admit a plug but covers the outlet when it is not in use, protecting it from moisture.